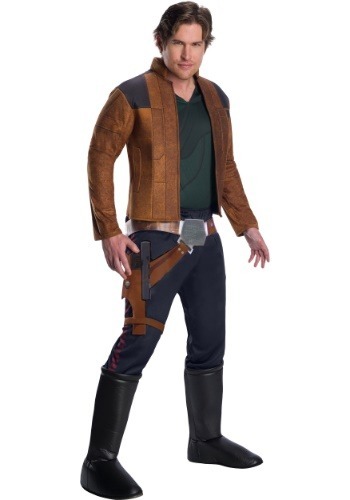 This costume comes licensed from Solo: A Star Wars Story. It comes with a jacket, a pair of pants, and a belt. The jacket is a light brown color and comes with an attached shirt front, making it easy to shift into the role of Han Solo. The pants have an elastic waist for easy fitting, while the bottoms end in foam boot covers that allow you to wear any shoes you like with the costume. Finally, the belt recreates the look of Han’s signature holster, which makes you look primed to shoot first when you wear it! Just put the costume on and you might feel ready for a cruise in the Millennium Falcon. Of course, you might have to engage in an intense game of Sabaac against Lando if you want to get one of your own. Also, be sure to check out our Star Wars blasters to make sure that you’re armed for any kind of dangerous situation!